I'll be brutally honest; this is not a page-turner nor is it exciting or entertaining. However, it is the best book for teens I've read on the Pacific War & the Asian Holocaust. It is informative, interesting and intense. 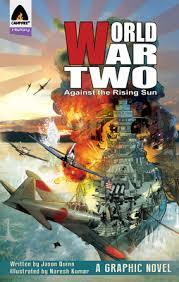 Compellingly unbiased this graphic novel tells the soldier's story of the Pacific War from every angle: the Japanese, the British the Burmese, the Thai, the Chinese, the Russians, the Indians (those fighting for each side), Malaysians, Australians and the Americans. While not being terribly graphic in either pictures or words, the author & illustrator pull no punches in showing the atrocities of the Japanese and their cultural mindset at this time. It also explores the plight of many countries trying to choose between their British Empirical oppressors or the tyrant Japanese who falsely promise an "Asia for Asians". Fantastic piece of work on this subject that every library with teen readers should have on the shelves.